SARANAC INN — Just how clean is Upper Saranac Lake? Scientists at Paul Smith’s College’s Adirondack Watershed Institute are in the best position to answer that question. They’ve been gathering data about the lake’s water quality since 1989. 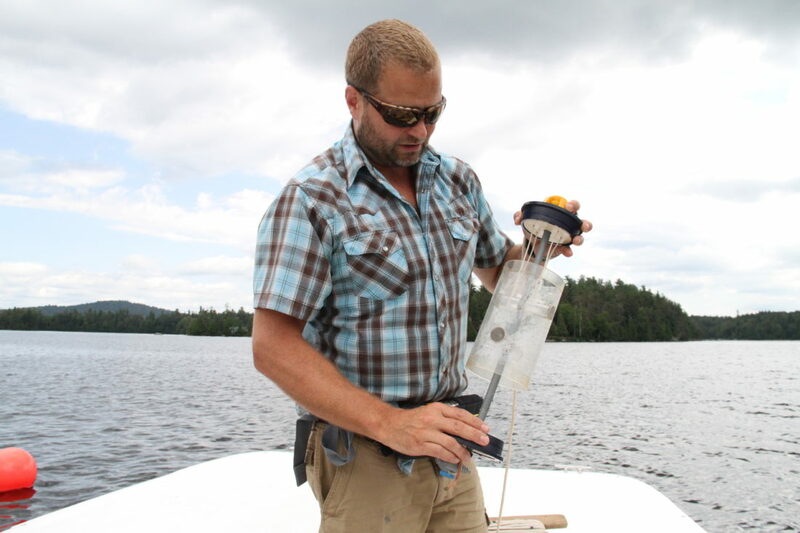 “Data is what you need to understand how the system is working, how the system is changing and how it reacts to things we do in the environment,” AWI Research Associate Corey Laxson said July 10 at the Saranac Inn boat launch after a data-collection trip on the lake. Upper Saranac Lake is one of the most intensely studied lakes in the 6-million-acre Adirondack Park, which has thousands of lakes and ponds and more than 30,000 miles of rivers and streams. The AWI collects data from a network of 94 lakes and 25 streams, covering 40 percent of the park’s watershed area. By monitoring the water quality, AWI scientists are able to ask questions about changes in the environment and hopefully catch things before they are too late. They can also create watershed management plans such as the one for Upper Saranac Lake. That was the thought when Paul Smith’s College created the Microcosmic Environmental Research Institute in 1989. 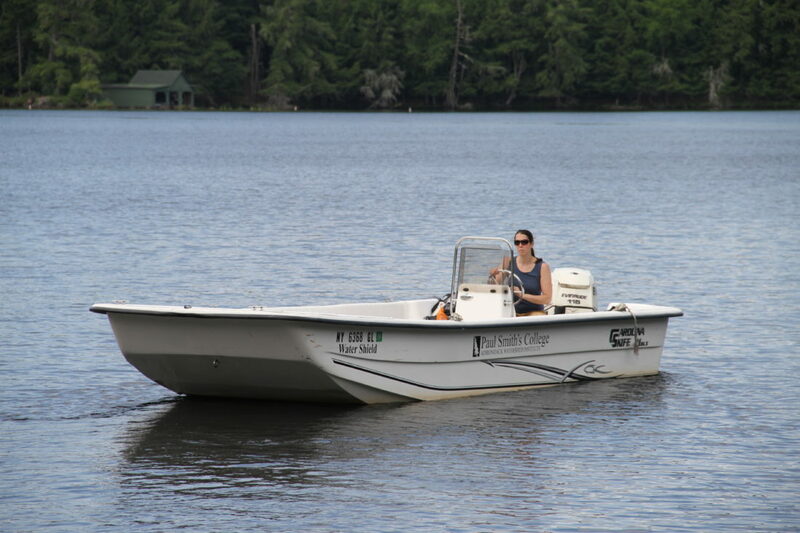 It was clear that the college and the Upper Saranac Lake Association, which hired MERI, were interested in finding out how many pollutants — such as phosphorus and nitrogen — were in the lake. So they began collecting data in the spring of 1989, and by June of the following year, they had predicted a blue-green algae bloom based on elevated levels of phosphorus. In July 1990, an algae bloom began to grow in Upper Saranac Lake, and it ruined the summer season for many camp owners and visitors. Blooms continued in subsequent years, leading many to point fingers at possible culprits: the Saranac Inn fish hatchery, septic systems, lawn fertilizers and storm runoff. Due to efforts to educate the public about nutrient loading, the Upper Saranac Lake community has been able to decrease the nutrients that are entering the lake, and the water quality has improved greatly since the early 1990s, according to Laxson. Over the years, Upper Saranac Lake and other Adirondack waterways have been faced with environmental problems other than algae blooms. Paul Smith’s College has expanded its water quality research based on those threats. In 1992, MERI became the Adirondack Aquatic Institute, and research was expanded to include other Adirondack lakes, streams and rivers. The program was expanded in 1999 to include invasive species management. In 2002, the organization was renamed the Adirondack Watershed Institute after merging with the college’s Watershed Stewardship Program, which began in 2000 to focus on local-scale invasive species prevention activities. Laxson said he believes the biggest threat to water quality in the Adirondacks is the spread of non-native and invasive plant and animal species. The state recently awarded the AWI a five-year, $9.3 million contract to implement the Adirondack Park Aquatic Invasive Species Prevention Program, a regionwide watercraft inspection and decontamination program to stop the introduction, spread and transport of aquatic invasive species such as Eurasian watermilfoil, zebra mussels and spiny waterflea. The AWI monitors invasive species in Upper Saranac Lake since the lake has a history with Eurasian watermilfoil. In 2004, the Upper Saranac Foundation created the Milfoil Control Project, hiring divers to hand harvest the invasive plants from the bottom of the lake. The harvesting — using smaller dive teams — continues to this day. Road salt has become one of the biggest threats to water quality in the Adirondacks. While Lake George and Mirror Lake in the village of Lake Placid have been targeted as having critical amounts of sodium and chloride, it is not as big of a problem in Upper Saranac Lake, according to Laxson. Laxson collects data from Upper Saranac Lake every three weeks from ice out in the spring until the ice forms in late fall/early winter. On July 10, he was joined by Research Assistant Elizabeth Yerger, who drove the boat to the collection spot in the North Basin and then to the Environmental Monitoring Platform in the South Basin. Laxson and Yerger use tools such as a data sonde, a cylinder about 2 feet long that contains instruments designed to capture physical, chemical and biological parameters of the lake. Laxson sends it from the surface to the bottom of the lake, which is about 53 feet at the North Basin, collecting data every 1 meter. At the South Basin, a floating Environmental Monitoring Platform automatically sends the sonde down to the bottom of the lake, about 85 feet, every four hours. The platform, supported by the National Fish and Wildlife Foundation and Upper Saranac Foundation, also has a weather station. It is solar powered, and the data is automatically uploaded to the AWI’s website, using cellular phone technology. Researchers around the world are watching AWI’s water quality monitoring program closely because the Adirondack Park is unique. The patchwork of public and private land has created a landscape that gives scientists different views of the region’s watersheds. In developed communities, lakes are impacted by a variety of human activities, yet there are millions of acres in the park with limited human activity because they are protected by state Forest Preserve. “And that allows us to study that least-impacted condition, which is valuable not only for us but for lake researchers around the world,” Laxson said.